Everything works, was used at our church up till the time we upgraded years ago. “The sale includes the rack unit, the ROM card that came with it, and a power cord. I MAY have the manual, but I can’t find it at the moment. The unit powers up and sounds great—clean, tinkly electric pianos, rich pads, deep basses. There are no onboard effects. I tested both the headphone and 1/4″ stereo outputs and all is well. There’s also an XLR/1/4” “Mix” out, which I’ve never used. The chassis shows its age: plenty of rack rash and I also noticed one rust bubble on the top, which should be visible in the photos. “The legendary Casio VZ10m. Luscious sounds. These are getting very hard to find. This unit has been racked and well taken care of. It has a few minor scratches, but nothing that affects its performance. Works fine, plays fine. “includes a VZ data card plus CD w/ 100’s of sounds via sysex files” Auction ended. Click here to browse on eBay. Unit pulled from studio and now storage. Have not tested it so will be as is” Auction ended. Click here to browse on eBay. 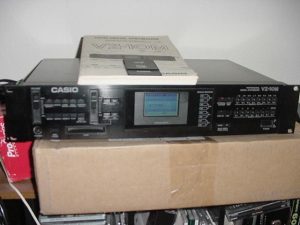 “Dont be fooled by the name – this Casio is a very professional synthesizer. It is based on the technology inside the Yamaha DX7 but offers more options. This MIDI synthesizer is 16 note polyphonic, with 8 part multitimbral capability. Single sounds (normal mode) are made up of up to 8 modules (think FM operator). Pairs of modules make up “lines”. You can either mix them, ring modulate them or phase distort them. (Phase distortion is a variation of FM synthesis used in the Yamaha DX, TG and FS1r series). You can also phase distort lines with other lines. The envelopes (pitch and amplitude) are 8 stage, each with a rate and level. In operation memory mode, you can create sounds with up to 4 patches on a single channel and set up layers and splits with lots of control over each of the layers. Think about it… this means that in Operation mode you can have up to 32 oscillators per note, and you can detune them. The results can be amazing, especially considering the low cost of this item. FEW SYNTHS OFFER THE SONIC CAPABILITY OF THIS SYNTH! This is a really great synthesizer – you can make extremely fat and complicated sounds with it. Its preset sounds are nice but if you spend some time to get to know it and you know how to program, you can make it sound incredible. There is a large screen, an entry fader and many buttons so editing sounds is very easy. Ideal for a wide variety of styles, like techno, R&B, synthpop, house, etc. If you are into sound synthesis, there is nothing like this synth – its sure to make 1 lucky bidder happy! This synthesizer is in great shape it has only been used in smoke free studio. Comes with original box, owners manual a ROM CARD and power cord” Auction ended. Click here to browse on eBay.